Many flowering shrubs attract birds with their berries and provide brilliant fall foliage. But these plants are perhaps at their best when in their bloom period when they can stand alone as specimens and serve as focal points in landscape design. Here are some favorite flowering shrubs. You are sure to find several that are ideal for your climate and landscape needs. 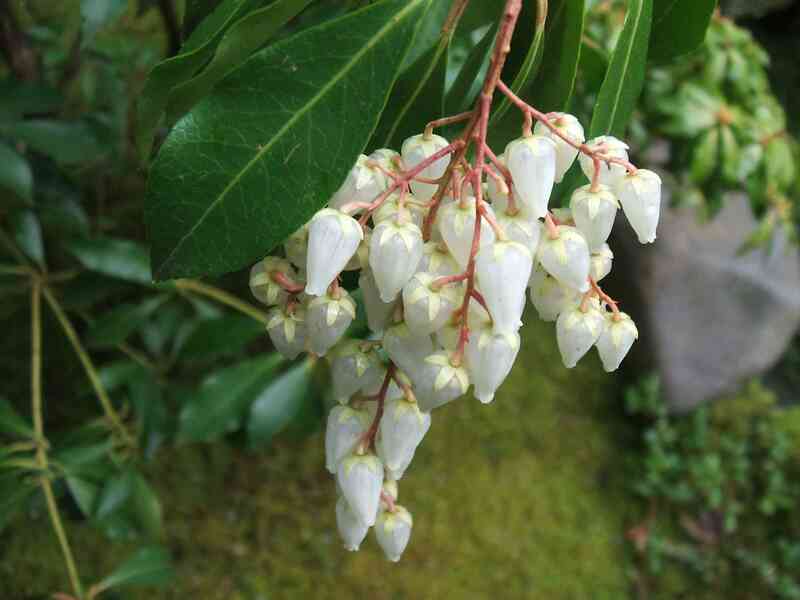 The blooms of Andromeda shrubs (Pieris japonica) are strong-smelling—fragrant to some, perhaps overpowering to others. However, everyone agrees that the white flowers on this spring-blooming shrub are a welcome sight after a long winter. Andromeda flowers are among the earliest of spring blooms, offering clusters of bell-shaped flowers that inspire another common name—lily-of-the-valley. In fact, Andromeda shrubs can cheer up the winter-weary even before spring arrives, since their broadleaf evergreen leaves and reddish flower buds offer winter color. These natives of China and Japan are suitable for U.S. Department of Agriculture hardiness zones 5 to 7. The shrubs can reach 6 to 8 feet in height, with a similar spread. Grow them in a moist, well-drained, acidic soil. They prefer partial shade, but will also tolerate deeper shade, although flowering may be reduced with less sunlight. These bushes are deer-resistant. Because of their evergreen foliage and shade-tolerance, Andromeda shrubs are popular in foundation plantings. They are used in shrub borders, as well. Several cultivars are available that improve on the original species. For example, two cultivars known for bearing new growth that is a fiery reddish color include "Red Mill" and "Mountain Fire." When Linneaus, the father of plant taxonomy, came across this plant growing on a marsh tuft in Lapland, he imagined the tuft to be the rock where the mythical princess Andromeda had been bound. The name he coined was later applied to an entire genus of related plants. The genus name of Andromeda was later changed to Pieris. Rose of Sharon (Hibiscus syriacus) comes in various colors. This shrub is not a rose at all, but a member of the mallow family, related to other hibiscus plants. Flower blooms are typically shades of white, red, lavender, or light blue. Rose of Sharon bushes are tall upright bushes that can reach 8 to 10 feet in height with a spread of 4 to 6 feet. A few cultivars are shorter, such as "Minerva," which reaches only 5 to 8 feet. They are suitable for USDA hardiness zones 5 to 9. Hibiscus syriacus is the national flower of South Korea. Considered sub-shrubs but often thought of as perennials, bluebeard shrubs (Caryopteris) are deciduous and provide landscape color for the late summer, just when the landscape can use a floral boost. This plant's blue flowers attract butterflies but also bees, which makes it a poor choice for landscaping near swimming pools or children's play areas. The flower clusters are airy: thus the alternate common name, "blue mist spirea." Bluebeard shrubs are not true spireas—the nickname comes because the shape of the leaves resembles that of spirea. Bluebeard shrubs may reach a mature height of 3 to 4 feet, which is slightly greater than their eventual width. The bush is listed for planting in USDA hardiness zones 5 to 9, but at the northern end of this range, the plant may die back to ground level from the winter cold. This dieback is not a problem since buds appear on new wood—the bush may simply remain smaller than it would in a warmer climate. Pruning time is late winter or early spring. Bluebeard shrubs prefer full sun and well-drained soil. Once well established, they can be considered drought-tolerant shrubs. Growers frustrated by deer attacks will be glad to hear that they are also deer-resistant shrubs. Since the 1960s, bluebeard has become a favorite species for xeriscape landscapes, due to its low-moisture needs. Different cultivars are available. Many gardeners grow "Longwood Blue." While some cultivars have fragrant flowers, this is not the case with "Longwood Blue." But its gray-green leaves do smell of mint. Newer leaves have a yellow-green color. Flowering quince (Chaenomeles speciosa) blooms in April before it puts out any leaves. Once you know this plant, it is very easy to recognize in the landscape, due to its distinctive pinkish red or orange flowers. Flowering quince grows best in USDA hardiness zones 5 to 8. Some varieties can grow quite large, but those most popular for residential landscape, the "Double Take" series, is about 4 feet tall and 4 feet wide. Once the leaves drop, these bushes do not offer much value to the landscape. It is usually grown in mass. Its spiny branches also make it a good choice for boundary hedges. Flowering quince's flowers are followed by small, hard berries that can be used to make delicious, tart jams and jellies. Forsythia shrubs (Forsythia x intermidia) are among the first bushes to provide the spring landscape with a burst of color with yellow blossoms that arrive before the plant puts out any leaves. Forsythia does well in USDA zones 4 to 8. Sizes vary depending on cultivar, with larger types growing to a mature height of 10 feet or more and small types achieving a height of only 1 to 2 feet. Most forsythia shrubs have a spiny habit that makes the idea for living border "fences" or as boundary hedges. Larger types and be used as specimen plants or trained on trellises. Some types make excellent foundation plantings. Forsythia is one of the first landscape plants brought back to Europe from China. It has been a mainstay in European and American landscaping for almost 200 years. Japanese kerria (Kerria japonica) gives you a lot of flowers over several weeks in spring just after forsythia blooms. The bloom time may last as long as six weeks in the spring and may rebloom in summer. 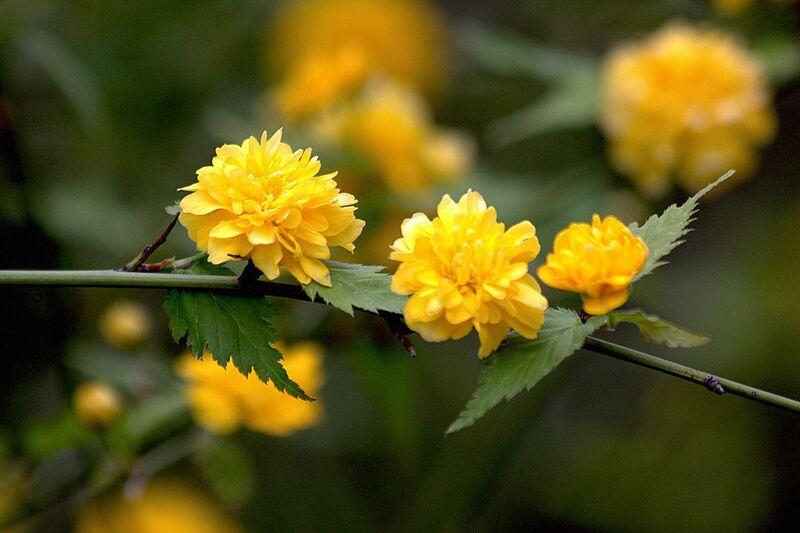 Japanese kerria's stems grow 3 to 6 feet in height with a similar spread. These stems are bright green in color and remain so during the winter). Yellow "button" flowers dot the stems on the types with single or double flowers. Because of the tropical hibiscus carried by some florist shops, many people do not associate large-flowered hibiscus varieties with northern landscapes. But hardy varieties with large hibiscus flowers, such as Hibiscus moscheutos, do exist. The blossoms are so large that they are sometimes referred to as "dinner plates." Although they have woody stems like other shrubs, hibiscus stems do die back to the ground in cold winter climates. Hardy varieties are suitable for planting as far north as zone 4. Hardy varieties typically grow to a mature height of about 5 feet tall with a similar spread. The plants blossom in mid-summer to late summer, drawing attention for the entire bloom period. Hibiscus plants have dark-green serrated foliage that is attractive but fairly sparse; these are shrubs that need to be planted where their large, showy flowers will be in full view. A pleasant-tasting, nutritious tea is made from dried hibiscus flowers. There are great plants that you may not know about, and then there are great plants that are a secret to hardly anybody. Rhododendrons fall into the latter category. The wonderful "rhodie" is so popular that even folks who do not know their plants very well can usually identify it. Like Andromeda, rhododendron shrubs (Rhododendron genus) are in the heath family. There are many colors to choose from, but lavender, white, pink, and lavender-pink are the most common colors. Although most garden varieties originated in the mountains of China, native species of rhododendron are found in the Appalachian Mountains of the eastern U.S. In eastern North America, the white, light pink, or red blossoms of mountain laurels light up the woods in late spring to early summer. It is a broad-leaf evergreen that provides year-round interest even after the blooms fade. Mountain laurel grows well in full sun to part shade and is ideal when planted under tall oak and maple trees. Some varieties are suitable for use in USDA hardiness zones 4 to 9. In the northern part of the range, make sure to buy varieties hardy to that climate. Mountain laurel is good in wet or swampy areas but also tolerates drought. In the landscape, it is best positioned in mass plantings combined with azaleas and rhododendrons with which it also partners in native environments. Mature height is 5 to 12 feet with spreads of 5 to 6 feet, depending on variety. Dwarf varieties are available for more confined landscape spaces. Laurels are members of the heath family, which includes azaleas, rhododendrons, and Andromeda, and like those cousins, it likes acidic soil. Roses are perhaps the most popular landscape shrub of all with species varieties and hybrids available for every climate and every landscape use. A wide range of bloom colors is available from the palest shade of white to deep violet-burgundies that border on black. Hybrid roses with season-long repeat blooms are a favorite accent shrub, either planted alone or in masses. Shrub roses that bloom once or twice a season are excellent as border or hedge plants. Ramblers can be trained to heights up to 12 feet or more along walls, fences, or trellises. Old-fashioned roses lend a delightful scent to a landscape. Shrub and rambler varieties are often hardy well into USDA hardiness zones 3 and 4, but hybrid roses need winter protection in cold climates, or must be grown as "annuals" and planted afresh each spring. Roses are genetically related to a number of fruiting plants including brambling fruits such as raspberries and strawberries. Like those plants, roses have a fruit structure—the fruit of the rose is called a "hip." If forsythia tells you that spring is here, then common lilac shrubs (Syringa vulgaris) let you know that summer is coming. Not only are the blooms on common lilacs beautiful to look at, but they are also among the landscape's most fragrant flowers. No moon garden in the North would be complete without the white-flowered version of these tall shrubs. Common lilac is ideal for USDA hardiness zones 3 to 7. It typically matures at 5 to 15 feet in height, depending on variety, with a spread of 6 to 12 feet. The most common flower colors are shades of lavender and purple, but whites and reds are also favored. Some varieties will rebloom in late summer or early fall. This is a very tough shrub that will tolerate almost any condition. It may require periodic hard pruning to keep it from overwhelming a small yard. Lilacs make a great informal hedge line ​or can be planted as individual specimen plants. Lilac become one of America's favorite shrubs after George Washington and Thomas Jefferson began planting them in their gardens. Like rhododendrons, azaleas are very popular choices for spring-blooming shrubs and are quite similar in appearance for good reason: they belong to the Rhododendron genus. Like rhododendrons, azaleas are early spring flowerers that thrive in woodland environments and prefer acidic soil. In residential landscapes, they are planted woodland groupings or used as foundation plantings. Unlike rhododendrons, no azaleas are evergreen, and thus they add no winter interest. In fact, after the blooms have fallen, these shrubs offer little interest to the landscape in summer, though they may add some fall color. They work very well in a large yard planted against a background of evergreens, which provide some of the acid that azaleas crave. Azaleas grow to a mature height of 4 to 8 feet with a similar spread, depending on variety. Varieties are suitable for USDA hardiness zones 4 to 9. Among the 80,000 plants and 350 species of flowers at Augusta National Golf Course in Georgia, there are thousands of azaleas comprised of 35 different varieties. The azaleas are usually in full bloom for the Masters Golf Championship every year in April. Vanhoutte spirea (Spiraea x Vanhouttei) is still a popular shrub, but not like it used to be. A relative to the rose, the thorny shrub blooms with white flowers in April and May. Vanhoutte spirea is suitable for planting in USDA hardiness zones 3 to 8 and grows to a height of 5 to 8 feet with a spread of 7 to 10 feet. It is often used for hedges, foundation plantings, borders, or as a specimen plant. Other types of spireas come in different colors. "Neon Flash" spirea, for example, has pink flowers, while "Gold Mound" spirea is valued particularly for its golden leaves. This plant is one of the most widely distributed flowering shrubs in the world, occurring naturally throughout most all of the Northern Hemisphere. Folks are fascinated with the idea of changing the color of hydrangea shrubs, to pink, purple, or blue, by changing soil pH. But do not forget the types of hydrangeas that reliably give you white flowers every year, regardless of soil. For a hydrangea with white flowers and interesting foliage, try oakleaf hydrangea, which blooms in spring and early summer. This is a modestly-sized shrub, topping out at 5 to 6 feet wide with a similar spread. It works well in mass plantings, as a foundation plant, or in woodland borders. The oak-like leaves provide attractive texture through the growing season, then turn a brilliant shade of red and orange in the fall. Oakleaf hydrangea prefers alkaline, lime soil, and is often a good choice for wooded areas where azaleas and rhododendrons cannot grow. The flowers of Korean spice viburnum give you a spicy fragrance to enjoy in spring, thus the common name. Showy pink buds appear in early spring, followed by fragrant white flower clusters. Next, come some red berries, provided a cross-pollinator is nearby. This shrub is 4 to 6 feet in height when mature with a similar spread. A more dwarf cultivar, "Compactum," stays a smaller 3 to 4 feet in height. Korean spice viburnum is suitable to grow in USDA zones 4 to 7. It grows well in full sun or partial shade and tends to like slightly acidic soil. Korean spice viburnum is one of the most fragrant flowering shrubs. It attracts many butterflies and also has the advantage of not being attractive to rabbits.